Left upper: Bone yatate with dragon among the clouds motif. Above left : bean pod hiōgi style yatate with the motif of two wasps - one on a leaf, the other on the pod itself. The bottom of the bean pod is uneven to show the pod’s swelling. The opening clasp is a larva coming out of the pod above the left wing of the lower wasp. You open the lid by pulling up on and turning the larva. Left: Hiōgi style yatate with ​​maki-e bamboo motif with mother-of-pearl on some leaves. L.24.1cm. The sides of the yatate depict what appear to be two nambanjin or "southern barbarian men". The term refers primarily to Portuguese and Spanish sailors, missionaries and merchants who sailed from the south, either from Macao or the Philippines, to reach Japan. The figures may also represent Dattanjin referring to Tartars. Additional research needs to be done to determine if the figures are nambanjin or dattanjin. The top of the yatate shows the Meoto Iwa or married couple rocks off the coast at Futami, Mie, Japan. The rocks are joined by a shimenawa, a heavy rope of straw. In Shinto the rocks represent the union of man and woman, husband and wife. The larger rock has a torii ​at its peak. Interior view of the four sections. The telescoping brush contracts and is housed in the circular chambers in each section. 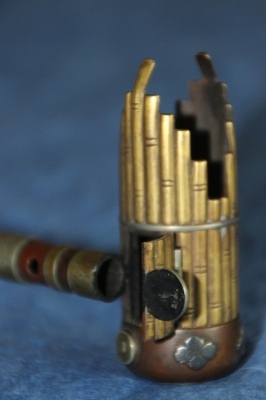 The orange colored bead, ojime, is used for tightening the cord on the inrō . Top: Disc shaped pocket yatate with mountain, river and temple motif, circumference 4.8cm. Middle: Yatate in the shape of a lottery case and telescoping brush, L. 6.1cm. and oval yatate with telescoping brush, L. 7.4cm.